This post is sponsored in part by Shades of Light. 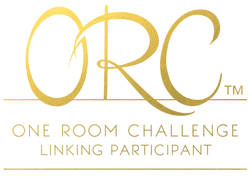 Welcome to week 3 of the One Room Challenge. 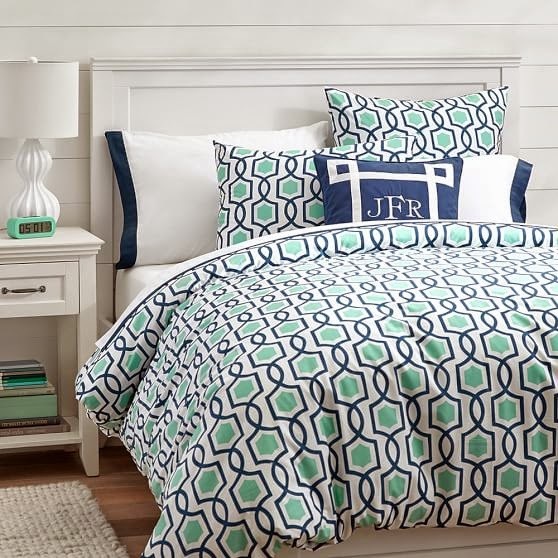 As you may recall from posts 1 and 2, I am working to create a bedroom for my 12-year-old daughter. This week I ran across the perfect side table for her space at Target. Don't you just love their Threshold line of home decor? The thing I love about this table is the fact that it's got a bit of contemporary flair. The majority of the furniture in her space is quite traditional, so I absolutely love the idea of bringing in a piece or two with more a more modern feeling. My other exciting find for this week is a lighting fixture. This is the Beaded Elegance Ceiling Fixture from Shades of Light. I adore it! It's got a definite feminine flair and as the name states - elegance. It's going to go a long way toward adding sophistication to the space. Because although I want the space to feel youthful and fun, I don't want it to be too juvenile. At this point, we're just trying to narrow down wall color. She really wants mint walls. I'm not completely sold. But I'm really debating the idea of just going all out and picking a fairly saturated wall color rather than the muted color that is more my natural inclination. So I ask you, my dear readers, what would you do? Saturated mint-colored walls, or something more subtle but still in the mint family? I'd really love your input! 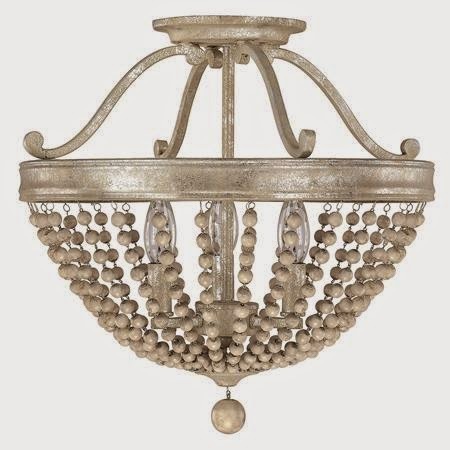 I will receive the Beaded Elegance Light Fixture from Shades of Light free of charge, but any opinions expressed about it are 100% mine. 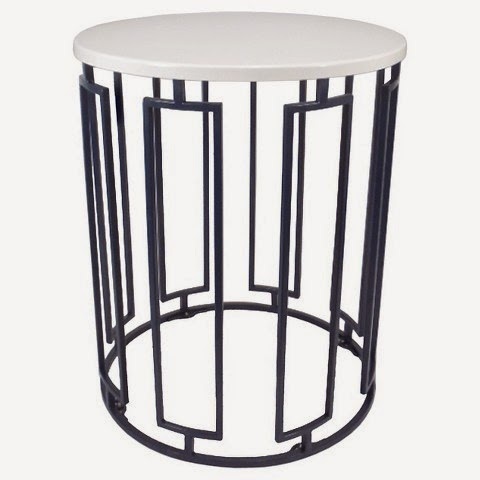 Love the side table!Can't wait to see how it all comes together! Good luck! LOVE it all! The bedding, the tables and that light ... gorgeous! I say go for a really light mint but still in the mint family. Everything else in the room will pop. OR you could paint the ceiling a saturated color. My 15 year old's room is repose grey (like the rest of our house) and her ceiling is an awesome turquoise. This was a compromise - she wanted Dr. Who Tardis blue on the walls. I'm thinking maybe a lighter mint,, just in case the faze for loving mint passes. I LOVE Target's threshold line of decor. I just saw a bunch of cool stuff in their ad this week. Love that side table... super cute. How about one wall in the saturated mint as a statement wall and the rest light. My daughter's room has been pale green (original to the house), *very* bright yellow; and currently *very* saturated cerulean blue. She's 15 now and wants to paint again-- I am leaning toward requiring a neutral. Then again, I think it's nice to give kids a bit of control over their room, and their taste for bright/saturated colors is often stronger than a typical adult. I can always repaint again... However, I have told her that this is the last time I'm painting-- any new changes and she's doing the work! I actually had this same light fixture in my compare list on Hite Lighting for my ORC guest bedroom renovation-- I decided to go with a different one though, but it's a great light for sure!